Tech News Technology History of Internet - What is the Internet! 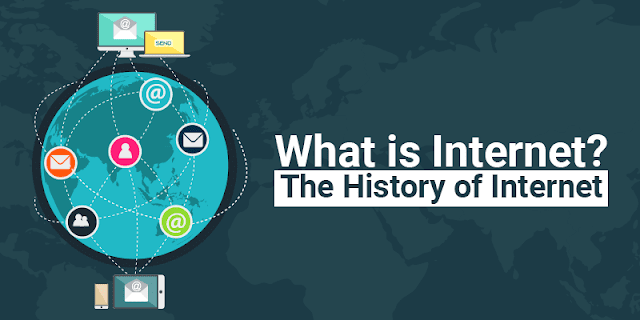 History of Internet - What is the Internet! Nowadays nobody can think of life without internet. Today every work is done by internet and life has become quite easy. Hours of work have started in minutes and we can easily talk to any person who is sitting in thousands of kilometers. Everyone has heard the name of internet and we have been using it for years in our life but do you know that "internet" is in fact what? Internet is a connected computer group, with the help of which any kind of information can be shared from one computer to another computer. To connect Computers, a lot of organizations interconnect TCP / IP and use the rest of the technologies to connect Internet with the help of Servers, Switches, Routers, Fiber Cables etc. Internet began in 1969 by the Department of Defense of America. He had developed a national computer named Advance Research Project Agency Network, which operated like a network and could send its message to the people without distraction from other people sitting away about the situation there during the war. . By 1971 ARPA Network had added about 2 dozen computers. After this, the post office of the 1979 Britannian made a computer network and from here it started a new technology and the world began to grow. After this, Bill Gates's company, Microsoft, in 1980, entered into a deal, according to which they considered putting their operating system on the IBM company's computers. In 1981, National Science Foundation gave fund to Computer Science Network, and further developed in ARPA NET. In 1986, National Science Foundation added a large network of its five Super Computer centers, which were called NSF net. In 1991, Switzerland's Center of European Nuclear Research created the Web for the first time and gave it to the world. Earlier, only text is used in the Internet, meaning that any kind of graphics, animation, audio, or video was not used before that. By 1995, after maintaining all the work, activity and traffic in NFS net internet, it separated Internet from its network, after which other companies, organizations that worked in the network. He handled the traffic of Internet. It was even easier to use Internet after Netscape in 1994 and Microsoft Browser in 1995. In 1995, only the first commercial website was launched and marketing from Email was started. Until 1996, Internet became famous all over the world and started telling people about them. This year, the number of people who used it were around 5 million. Since 1999, e-commerce sites have been brought to the forefront of the world, things have started to be bought and sold through internet, and since this year, so far this sector has been so developed that today it is the most popular part of Internet. . In 2003, New Zealand (NIUE) introduced 'Wireless Access' System in Internet. Since then, Internet has made so much progress in the world that it is not possible to do any work without it. Whether it is talked to anyone, whether there is any problem related to shopping or sitting at home, the internet has the answer to every thing and the solution to every problem. This sector is continuously growing and many new technologies are coming in the market in the coming times. Internet started in India in the 80s when the Education and Research Network was promoted by the Indian Government, the Department of Electronics and the United Nations Advancement Program, but its use was started on August 15, 1995. Since then, there has been a steady increase in the number of people using Internet in India. The Internet and Mobile Association of India (IMAI) had done a research and it was revealed that India is third in the world in terms of using the Internet and it was stated that by October 2013, India had 200 million The Internet users were consistently increasing and its number was increasing. There is a possibility that there has been a huge increase in the number of users in the year 2016, people in India use Internet as well as for banking and shopping. Today there are more than 142 Internet Service Providers (ISPs) in India, which are providing broadband and Narrowband Internet services, in which Airtel, Vodafone, Idea Cellular, Reliance Jio, and Reliance Communications are the main ones.